In a spiritual sequel to last week’s dungeon meetup, Josh and Emily continue to discuss the nuances of how we feel about things that we don’t have, whether they’re in the past, the future, or alternate realities. If this sounds awful to you, keep in mind that they do so while listening to some super classic tracks from some super new patrons (thanks for using those +1 tickets ya’ll). Why do we feel sad when we’re happy? What happens when we die? Would Jay Gatz and Mickey Mouse be friends? Find out here at the VGM Jukebox Episode 20, yo! Keep bringing those +1s! Even +2s and +3s! The bar is spacious. Wow, you guys went waay out there. I'll never be able to listen to Starlight Zone the same way again! Just before I listened to the episode, I was telling a co-worker how the conversations on the podcast had continued on the blog and amounted to English major(types) having philosophical discussions, which we both agreed was more accessible and less esoteric than Philosophy majors having philosophical discussions. The conversation about death was fun; Emily's post-modernist view and Josh's decidedly eastern perspective are pretty opposed in and of themselves, but somehow they found a happy cohabitation. I'll ask my daughter by what moniker she'd like to be addressed, but I'm sure she'll be excited to hear her selection was picked. It's such a bittersweet piece. My oldest boy's selection is close behind! Oh, and a contribution to the nostalgia lexicon: NAZUKASHII. It's a feeling of warm nostalgia that occurs when one is reminded of their young childhood. One of the TAs in my Japanese class introduced me to the term when we ran into each other in a McDonald's and I offered her a piece of Marukawa gum. I was an English major and a Philosophy minor. In other words, ya nailed it. And I will definitely be incorporating nazukashii into my vocabulary! Oops. Nathan, I permanently deleted one of your own removed comments, and it erased its nested replies instead of redistributing them. So, Thorn-chan's decision and my response to it now live only in our e-mail notifications. Sorry! In the future, if anyone removes a comment, try not to nest anything under it. I do go back and prune those out, and I wouldn't want to accidentally delete stuff connected to them if I'm not being super careful. Thanks guys! Hey, thanks for playing the track I suggested! I hope I didn't come off as upset at LMH or anything. Their Neo Geo episode is one of my favorites and it introduced me to the earlier games I wasn't familiar with. Also, I totally forgot about the karaoke challenge when I suggested that track. Sorry/not sorry! I'll definitely be sticking around, though! I've had lots of ideas for tracks to suggest for a while. It just seemed appropriate to break the ice with a golf game. I can hardly wait. That golf track was bonk! Nah goemonsama, you didn't come across as upset at all, so don't worry! And thanks for being one of the patrons who takes it upon themself to bring us the super jams that miss the LMH window. Act 1: A fondness for something in your past and a desire to return to it. It is often quite acute, like feeling of listening to a song from your childhood that you haven’t heard since. Act 2: A habit or activity that could inspire nostalgia as described above. 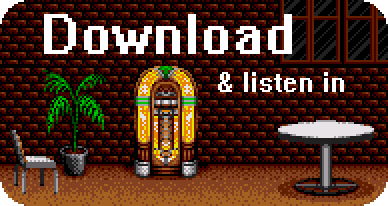 We have an example before us, the VGM Jukebox podcast. We seem to agree that this may be fuelled by nostalgia, but is not itself nostalgia or nostalgic. Act 3: A longing for a time and a place in the past that you did not experience; banana candy nostalgia. Perhaps it is a very similar but not identical shade of feeling than Act 1-nostalgia. Act 4: A longing for a future that you know will never come; reverse nostalgia. Is this another shade of nostalgia, or something different? It was suggested that this is not nostalgia because nostalgia involves gratitude that the time you are nostalgic for happened at all. Act 5: A contemplation of what could have been; sideways nostalgia. The object here is not the past or the future but a present that isn’t this one, and perhaps also a past that isn’t the one that happened. If Act 4-nostalgia isn’t truly nostalgia for the reason suggested, then neither is this. Act 6: Nostalgia for the present, this present; wistfulness. Borne from fondness for the time you are experiencing right now, the knowledge that this moment will never come again, and the belief that one day all memories of it will be gone. I think it takes courage to think like this, to contemplate mortality and not shrink from it. Act 7: Desire to experience a future that you know will happen; anticipation. On the one hand this is clearly not nostalgia, on the other it is linked to the reality of time like nostalgia seems to be. And wouldn’t we expect it to fit somewhere between Act 4 and Act 6? Isn’t longing for a future that is somewhere between longing for a future that itsn’t and longing for a present that is? I will mention here the suggestion that nostalgia is longing for a time that is somehow inaccessible. Act 8: A feeling of warm nostalgia that occurs when one is reminded of their young childhood; Nazukashii. Presumably this is a particular kind of Act 1-nostalgia. I sometimes wonder if the Japanese are a particularly nostalgic people, and if nostalgia for pre-war Japan is a part of that. Bonus Stage: Phantasy Star III nostalgia; nostalgia for the game that you are still playing. The object was a generation or generations ago in fictional time but not so long ago in reality. Meta-Bonus Stage: The nostalgia I feel as a play the bonus stage. I have heard enough interesting bits and pieces about Phantasy Star III to be intrigued, but never played it. Thus I think with some wistfulness about having experienced Phantasy Star III-nostalgia while contemplating a future that may or may not come to pass where I do play and experience Phantasy Star III nostalgia. If I have missed any shades of nostalgia that were mentioned or you think there are any details that should be added or changed, please comment. Oh hello greatest comment ever. It is nice to read you! Looks like we definitely need an official VGMJB lexicon now! I might do this as a side-project in the next few months. A "side-nostalgia" project? Wonderful. And Spritz deserves a golf clap. Maybe a fighting golf clap. Hey all, this is not directly related to the episode, but Retronauts just came out with an episode dedicated to the Sega Master System, roughly coinciding with its 30-year release. Josh, I know you were a fellow SMS guy so I thought you might find 4 guys blathering endlessly about such esotera of some import. Cheers! Thanks for the tip! They were a little harsh to some of my favorite games, but it was a good listen. HAJ-kun, your accent sounds so Josh-like! Yeah, I like Retronauts, but the two hosts were Nintendo kids growing up, so it shapes the way they approach off-platform material. Of the two, Jeremy Parish really makes an effort to be non-partisan, but every once in a while they'll say something that gets my spidey-sense tingling. That's why I was really glad they brought along the two "expert" guests. Those guys do really good work on their own sites; I definitely recommend checking out the Sega-16 stuff. They mentioned Kenseiden; that IS a brutal game, but I was 12 when I beat it, so it couldn't have been THAT hard. I think a difference between their opinions and ours is that we played a lot of those games when they initially came out, so our NOSTALGIA-tinged viewpoints might enable us to accept and enjoy games that people without our childhood experiences couldn't. Loved the discussion about death, never thought I'd be listening to that sort of thing on a VGM podcast! I'm personally agnostic (I like to say I'm an atheist who wishes he wasn't) but I've also read something or maybe made it up myself about the way we experience time being a construct of our brain, or the way our brain processes time. The way I think of it is that in another perspective than we can perceive, time is directions like left or right (ie. like past and future) and so from that perspective the future is just like the right side of a painting and the past is the left side, and if you're inside the painting and looking left you might see the end of the painting as the end of your existence but from above the past and future will always exist as part of the whole. Your ideas about time remind me of Interstellar, which in spite of the usual Chris Nolan flaws is onet of the best movies I've seen in the last few years. You also reminded me of something I realized when Emily was sharing. It is a great irony that those least invested in the idea of a transcendent reality and life after death, are the same people who would most greatly benefit from the solace belief in such an idea would bring. It often seems to me that humans are hardwired to believe in such a thing, which explains(to me anyway) why a lot of atheists are so unsettled by the finality of death. I would say most people are unsettled by death, just those who believe in something have something to hang on to! Some aspects of death are unsettling, but a lot of our modern society's acute fear of death is related to the way it's sanitized and hidden from everyday life. The only way our society feels comfortable dealing with death is through entertainment, which is much sadder and more disturbing to me than death. That maelstrom I spoke of earlier eventually led me to convert to Orthodox Christianity. I'm not here to proselytize my faith, but one of the things that really resonated with me was the way they respond to death. There has been a general shift in our society from open-casket funerals to closed-casket, and now even those have been replaced by "memorial services" or "celebration of life" events. The idea is that people would rather remember the deceased as they were in life, but the result is that people continue to avoid thinking about mortality as part of life. Traditionally, when an Orthodox Christian dies, the body is not embalmed. The casket is placed in the church as soon as possible, open casket except for special circumstances, and people sign up to read Psalms through the night in the church. At the end of the funeral service, everyone has the opportunity to say last goodbyes and give a final kiss to the deceased, after which point they would go straightaway to the cemetery and place the casket in the ground. As morbid as some of that may seem, it is incredibly therapeutic to be able to say goodbye to someone in that way. I think it's actually more healthy in psychological terms. Even animals such as dogs and elephants react to a death in the group/pack/herd more calmly when they can see and touch the body. Guys, Neo Turf Masters...my world is changed.